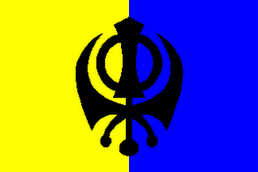 THE ROAD TO KHALISTAN: Has the Need For Khalistan Passed? Has the Need For Khalistan Passed? While I am awaiting the outcome of a brother's biopsy, I have been revisiting somr blogs I haven't read in a while. 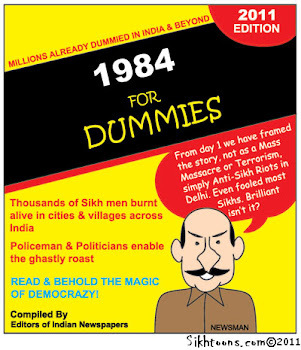 This is reprinted from The Confused Khalsa Rambles. I have myself briefly been a guest of the Punjabi police, but I have been told that 'it's not like that any more. Do tell. Is that true and do we need a country for our nation as a place of refuge. I believe this article answers that in a resounding YES. Be warned: the following pictures are not for young children. Deadly facts about torture during interrogation in Punjab have come alive in a study on custodial deaths by the Institute of Correctional Administration. As many as 50 per cent of the police officials talked to have admitted that third degree methods are used against the suspects due to social and political pressures . The study, carried out by the institute’s deputy director Dr Upneet Lalli, has further revealed that need for conducting speedy investigation is another reason. “There is a pressure (on the cops) to perform as also pressure to conform”, the report says. For the purpose of the conducting the study, as many as 150 police officials were talked to. The report adds: Lack of accountability and almost total immunity enjoyed by the police until recently accounts for the fact that 58 per cent of them feel there is no sense of shame in cops accused of torture. Only 27 per cent say their colleagues feel bad about the use of force to effect confession and recovery. “There seems to be no clear cut message from the top about intolerance to torture as 18 per cent feel their seniors will feel bad. Another 27 per cent have opposite to say,” the report asserts. Just 10 per cent of the police personnel are aware of the guidelines issued by the National Human Rights Commission on custody-related issues. Only 12 per cent are correctly able to specify the Articles of the Constitution dealing with the matter, even though a majority of them are aware of the Supreme Court verdict in D.K. Basu versus State of West Bengal case. The voluminous 200-page study “Custodial Deaths and Human Rights Commission - an analysis of its role and prevention” has already been submitted to the Punjab State Human Rights Commission. Quoting the contents of the report, the sources in the commission say just one-fourth of the officers talked to admit consultation with their seniors or the relevant rules in case of doubt about their powers. As many as 90 per cent police personnel from the state and even outside agree to the need for adopting scientific methods of investigations against the hardened criminals. “The main kind of abuse a person faces in police custody has been mentioned as physical (41 per cent) and mental (67 per cent),” it adds. “The main reason behind deaths in police custody has been mentioned as torture, medical negligence and drug addiction”. 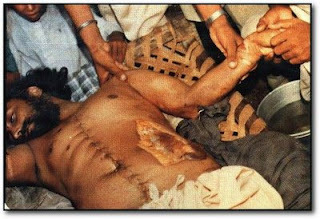 Avtar Singh, a candidate for the Punjab Assembly brutally tortured (with hot iron and electric shock) and murdered by the Indian Police.Another example of the barbaric behavior of Indian Security forces. This is the treatment Sikhs get in the so-called "largest democracy in the world." 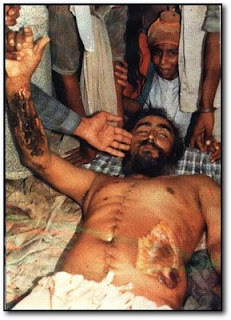 His abdomen was burnt by using a hot ironing-press. His right fore-arm was cut open. All the major bones in both of his arms were broken. 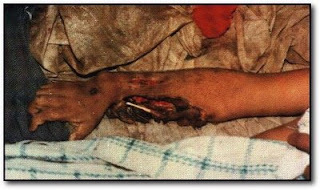 Hot pinchers were used on his wrists to poke burn his skin. This is just one case, of literally thousands. Amnesty International and other Human Rights Organizations have been crying out about these abuses for decades, while the Panjabi people like myself are living comfortably and whenever someone mentions a case of torture, or police brutality its taboo. We begin covering our ears, and try changing the subject. We're basically ignoring a problem, like the ANI propaganda about drug abuses in current day Panjab. These cases of torture are NOT a thing of the past, you just have to look at two recent detainee's Bhai Panjab Singh (UK) and Bhai Jagtar Singh Hawara. The only reason we hear about these cases of torture is because these people are 'high profile' Sikhs, many are still in jails since the 1980's WITHOUT TRIAL who are simply forgotten. Nelson Mandela went to prison and became Prime Minister. Sikh Women have suffered no less. The only way these things are going to stop, is if we realize as a community, or atleast accept these things are happening. How can a problem be solved, such a huge problem, if we dont even accept it exists? There have been many recent efforts to promote awareness of female infanticide, a problem rife in Panjab for centuries. It is only after accepting a problem that we can begin to address it. Wake up, wake your families and friends up. For you it's a short conversation, for another human being it could be freedom. Feel free to forward, circulate or cut any part of this post.